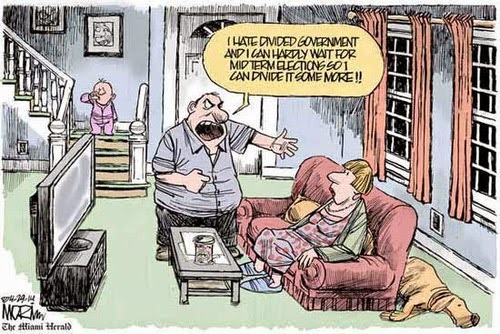 The Dividist Papers: All we are saying, is give divided government a chance. 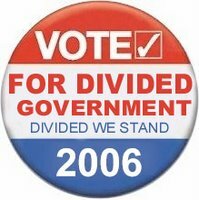 All we are saying, is give divided government a chance. Certainly, disgruntled conservatives are not a new phenomena this electoral season. God knows, this crop of big spending, big deficit, big government congressional Republicans under the mantle of this big spending, big deficit, big government President certainly gives conservatives plenty to be disgruntled about. But disgruntled conservatives explicitily calling for a divided government in 2006 by voting for a Democratic majority in Congress? That is news. This week in the Washington Monthly, seven conservatives write in "Time For Us To Go" why the GOP should lose in 2006 . "This must all be shocking to my Republican friends who still believe our country would be a better place if our party controlled every branch of government as well as every news network, movie studio, and mid-American pulpit. But evidence suggests that divided government may be what Washington needs the most." 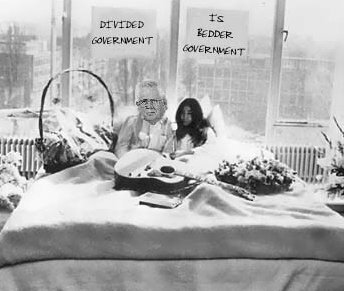 Can't you just imagine William Niskanen picking up a guitar and singing a duet with Yoko Ono while sitting on a bed in a Montreal Hotel: "Give divided government a chance"? Um. Nevermind. Neither can I. In the article Niskanen repackages and freshens some of his previous work on divided government. "Republicans have shied from challenging Bush by placing party loyalty above institutional loyalty, contrary to the expectations of the Founding Fathers. They do so in the fear that embarrassing or discrediting a Republican president might reverberate to their political disadvantage in a reverse coat-tail effect. Democrats, for their part, likewise place party above the Constitution, but their party loyalty at least creates an incentive to frustrate Bush’s super-imperial presidency. This could help to restore checks and balances. For the foreseeable future, divided government is the best bet for preserving both the letter and spirit of the Constitution." "Successful government by either Democrats or Republicans has always been, above all, realistic. FDR, Eisenhower, and Reagan were all reelected by landslides and rank as great presidents who responded to the world as it is, not the world as they would have it. But ideological government deserves rejection, whatever its party affiliation. This November, the Republicans stand to face a tsunami of rejection. They’ve earned it." "Conservatives are as angry as I have seen them in my nearly five decades in politics. Right now, I would guess that 40 percent of conservatives are ambivalent about the November election or want the Republicans to lose. But a Republican loss of one or both houses of Congress would turn power over to the likes of Nancy Pelosi and Harry Reid. Dare we risk such an outcome? The answer is, we must take that chance. If Big Government Republicans behave so irresponsibly and betray the people who elected them, while we blindly, slavishly continue backing them, we establish that there is no price to pay for violating conservative principles. " "I’m less sanguine about the bipartisan comity argument, though. Whether it’s a function of talk radio, the permanent campaign, or something else, American politics has been incredibly polarized for the last twenty years or so; to some extent, since the Vietnam/Watergate era. Certainly, there have been periods throughout our history, going back to the Colonial era, even worse than the present. But they tended to be sporadic rather than permanent. The opposition party is in permanent destruct mode against the sitting president, which ever party or leader fills those roles. I can’t see how a Speaker Pelosi would change that." 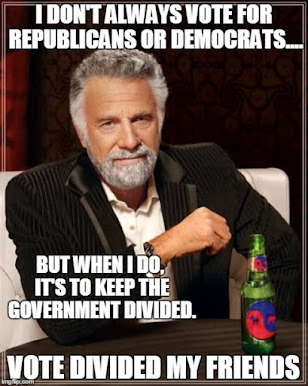 As pointed out by Norman Ornstein - Congress does not work better because of "bipartisan comity", it works better when each party has a "piece of governing", and they are forced to find a bridge acrosss across a polarized divide. An atmosphere of mutual distrust significantly improves oversight. The worst of each party's inclinations are subsequently stripped out of legislation, with better legislation and better governance as a result. From the left, Prometheus 6 also takes note of the series with his post "Conservatives on why the GOP should lose in 2006". He claims that "I can't wait to see some real conservative thought again." I am not sure he is sincere. The Washington Monthly series continues to garner attention in the mainstream media and across the blogosphere, with the Divided Government meme at center stage. To our right/left selections, we add some representative samples from MSM, a moderate, and a scholar. "when the sharp-eyed satirist Christopher Buckley turns his quill against the president, boy, alert the zeitgeist police. Buckley is, after all, the author of "Thank You For Smoking," which became a major motion picture. He is also a loyal Republican. So when Buckley unloads on the president -- and without a lot of cheap gags -- it gets my attention. " "If you boil it down, these articles echo what we've repeatedly suggested on this site: that classic conservatives who followed and honor the memories of Barry Goldwater and Ronald Reagan (and in some instances the first George Bush) don't like what they see and want their party back." "Joe Scarborough writes that the "evidence suggests that divided government may be what Washington needs the most." "All we are saaaying, is give divided government a chance." "All we are saaaying, is give divided government a chance." I'm responding there to this from Bruce Bartlett: "America is much more effective in the international arena when it has a high degree of bipartisanship in its foreign policy. In the not-too-distant past, Republicans including Arthur Vandenberg and Democrats including Daniel Patrick Moynihan understood this." If your sole argument is that divided govt helps restrain spending and the creation of new programs, there's pretty good evidence for it. The authors collected by WM, though, go substantially beyond that in their claims. True enough. In this blog I have focussed primarily on the economic issues, for exactly the reason you state: It is the best documented claim for Divided Government, with strong supporting evidence. The Republican's have also done everything they can dounder this administration to prove the complementary case that single party government is fiscally irresponsible, regardless of party. The other claims made in the series are more open to debate, and from my perspective - just gravy. I'm very serious. Just note I'm using 'conservative' the adjective, not 'Conservative' the noun. I can deal with people who feel secure with their approach, that need proof before letting go of something that works for them.